Hey, are you interested in joining VIRTUe? Currently we are recruiting a complete new team to take on the next challenge: Solar Decathlon 2021 in Wuppertal. Will you be part of it? If you are interested in sustainability and passionate or curious about improving our built environment, this might be the perfect project for you. We are looking for people with a professional attitude and who are willing to invest some time in this amazing learning experience. For a full time function, count on 20 hours in 2019/20, and 32 in 2020/21. On this page you can find all our vacancies. To apply, just send an email to [email protected]. In your application you should include what function(s) you are applying for, your CV and a motivation letter. Don’t worry if you don’t fit the description 100%, we are all here to learn! Want to stay up to date on the recruitment for the next team? Subscribe to our mailinglist. Do you want to test your management skills and do you think you have it in you to work together with your fellow board members to lead a team of over 40 students? Then maybe a board function is something for you! The board is responsible for the overall planning of the project and functioning of the team on an organisational level. There are 5 board members, each with their own specific responsibilities. As a team manager you are the internal and external face of the team. You will chair general members meetings, advisory board meetings and board meetings. You are also responsible for human resources, that is, making sure all team members (can) do their work in the best way possible, recruiting new members and organising evaluations. You are also the primary contact person for the TU/e and Solar Decathlon organisation as well as anyone who contacts VIRTUe in general. For this function we are looking for someone who has strong leadership skills and likes to work with people more than anything. You should be able to be critical as well as supportive and should not be afraid of some organisational work such as planning and keeping people focused on their tasks. As resources manager you represent VIRTUe towards (potential) partners. With a team you will work on acquisition of partners and manage the relationships with current partners. You will work closely together with the financial manager to make sure the budget is closed and with the communication manager to ensure good partner representation. For this function we are looking for someone who likes and is good at networking. You should be representative and professional and follow through on promises and conversations. A pro-active attitude is essential as well as the ability to plan and keep an overview of many simultaneous timelines. As financial manager you will make and guard the budget and make sure the rest of the board and team is aware of the financial situation. You will manage all money matters, including financial administration, writing subsidy applications and handling declarations and invoices. More than anything you should be willing to learn for this function. Financial administration is not something that we expect you to have experience with, but as long as you can work precisely and structured and have good communication skills, you could be a great candidate! 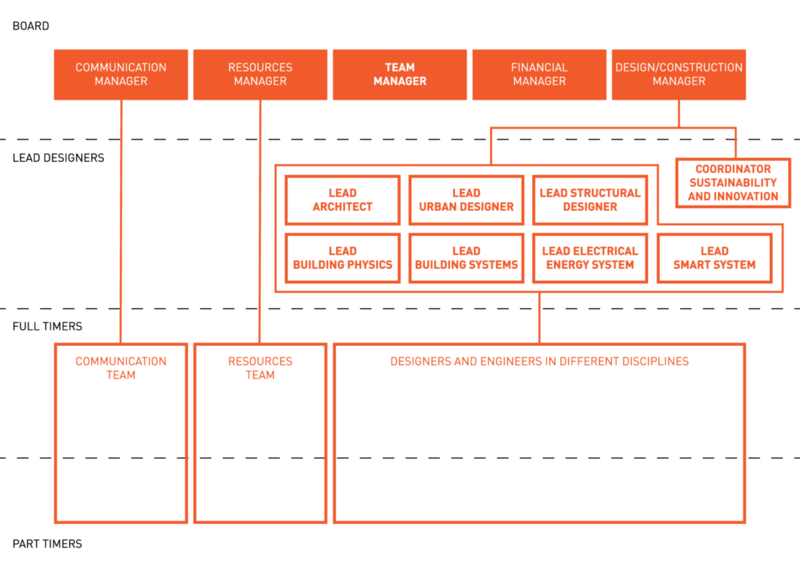 As a design manager you are in charge of the team of lead designers (oof..). You will keep track of the overall design process and make sure all disciplines get represented. This includes organising and structuring the design team and process and making sure decisions are made in time. With your team, you will also work on competition strategy and risk management. When the time comes, you will also be responsible for construction management, again with a team to support you. You will plan and organise the construction process, this includes working closely with construction partners and making sure health and safety standards are respected. For this function you should be willing to learn about each discipline on a global level. You have to be goal oriented, rational and able to prioritise and make decisions while still being open minded. Most of all, you need strong leadership skills and you should be able to cope with stress and deadlines. All in all, we need someone with a ‘make it happen’ attitude! As communication manager you are responsible for everything PR together with the communication team which you manage. This means making sure we are actively communicating on social media, attending and organizing events and that we appear in traditional media every now and then. You are, next to the team manager, spokesperson for the team. Also, you work with the resources manager to make sure partner representation is handled well. For this function you need to be creative, energetic and outgoing. You need good presentation skills and should not be afraid of the spotlight. Next to that you should also have good planning and organisational skills. Do you want to be right in the middle of the design process of a project that will actually become a reality, and are you able to manage a team of designers and engineers to help you reach the best possible outcome? Then maybe you are one of our next lead designers! The 7 lead designers work together to develop the overall concept of the project and each one leads a team of designers and engineers that will make this concept into a concrete design. As a lead designer you make sure the end product is a well integrated design, you make sure the planning is respected and deadlines and deliverables are made. Also you work with communication to make sure the design is presented accurately and in collaboration with resources you will maintain contact with external parties that help (execute the) design. Architecture is where this whole project comes together. In the words of the SDE organisation, architecture is about the coherence of the design, the flexibility of space, the integration of technologies and the incorporation of bioclimatic strategies. It is also essential to take into account the spatial and socio-economic environment of the Netherlands. As lead architect, you will lead a team that works on the architectural design of the house, from concept to the smallest details. Of course, the architecture should be informed by all other disciplines, bringing them together in a coherent way. You will also play an important role in overseeing the execution of the architectural design during construction. For this function, we are looking for a (prospective) master student in the architecture track. Urbanism plays an important role in this edition of the Solar Decathlon. In the words of the organisation, urbanism is about the integration of the house design into its context. In particular, the value created and added to the community by means of a renovation will play a particular role. A specific urban context needs to be chosen in which the design will fit. This means things such as economic strategy and transportation also need to be taken into account. As lead urban designer, you will lead a team that will research the urban context and will work on a design on an urban scale that will inform the design of the house that you will enter the competition with. Your work will have impact and therefore should be informed by all other disciplines. For this function, we are looking for a (prospective) master student in the urbanism track. As the lead structural engineer, you will lead the team that will make sure the house is structurally sound. Of course, the competition is looking for sustainability and innovation in each facet of the design, including the structure. Therefore, it’s important that you are open minded and are willing to go the extra mile to research unusual solutions to make your ambitions as a team a reality. You will also play an important role in overseeing the execution of the structural design during construction. For this function, we are looking for a (prospective) master student in the structural engineering track. As the lead building physics you will lead a team to work on optimising acoustics, daylight, passive ways of saving energy, etc. You’ll have to look further than just the single house that will be build, and also think about how solutions would work in an urban context. Next to that, you will be responsible for fire safety of the house. The contests on which you work are largely measured, so you and your team will also have to think about strategies to optimise the systems you designed during the competition. For this function, we are looking for a (prospective) master student in the building physics and services track. As lead building services you will make sure the house is functional and a healthy place to live in. That means, you work with a team on designing systems for plumbing and indoor air quality and making sure all necessary appliances are present and working, while minimising the energy demand. For this function, we are looking for a (prospective) master student in the building physics and services track or a (prospective) master student in Mechanical Engineering. As lead electrical energy system you will lead a team that will make sure the house is always supplied with sufficient electricity. That means you will design the solar energy and storage systems and will think about and propose a distribution system on an urban scale. For this function, we are looking for a (prospective) master student in Electrical Engineering or Sustainable Energy Technology. You can’t show up to a sustainable innovative building contest without a smart control system. As lead smart system you will lead the team that will design and realise a smart control system that fits the concept you will enter the competition with. Next to the control element, you should also think about how the system fits in an urban context. This is your opportunity to propose the ultimate smart city. For this function, we are looking for a (prospective) master student in Computer Science or Mechanical Engineering: systems and control. Although this function is not a lead design function, you will work very closely with the lead design team. As coordinator sustainability and innovation, you will work with the lead designers to form a strategy for circularity, sustainability, innovation and viability. After this you will validate the decisions of the design team to this strategy and make sure they stay on the path towards a design coherent to the concept. Also, you will collect the decisions made and process them in a life cycle analysis. For this function, we are looking for a (prospective) master student in Innovation Sciences, Sustainable Energy Technology or another relevant master program. VIRTUe couldn’t be a functional team without its full timers that are not in managing functions. They do the bulk of the work in almost all parts of the project. In our team we have three groups of full timers. The designers and engineers who work on developing the product that we enter the competition with. The resources team that makes sure we have the funds, means and experience from external parties to make it all happen. And finally the communication team, who makes sure the world knows that this project happens and works on an essential part of VIRTUe’s mission: inspiring and educating about sustainability in the built environment. As a designer or engineer in VIRTUe, you will work hands on on developing and realising the design for the house that will enter the competition. This includes doing research on and working out parts of the design in a team. It is also very important to coordinate your work with what other members are doing, this is truly a multidisciplinary project! You can apply for full time positions in all disciplines specified in the lead design section. Please look there for a description of the disciplines. In your motivation letter, specify what your specialization or main interest is within the discipline and what kind of tasks/subjects you see yourself working on. Don’t worry if what you envision yourself doing isn’t mentioned in the description, we welcome all new ideas. As a communication team member, you will work on one or several of these tasks. Please specify in your application what tasks you are interested in/good at. As a member of the resources team you will work on acquisition and will lead negotiations with companies about sponsoring contracts. You will have to work closely together with the (lead) designers and engineers in one or more disciplines to find and land resources for them. This is a great opportunity to get into contact with many companies and work on your professional network and skills.